First you must charge the gemstone or Shiva lingam with positive energy, this is easily done simply by focusing on the task you want to do such as balancing and healing the aura or chakras together with an affirmation something like; may this crystal balance and heal my aura or the the aura of the person you are dowsing for. Keep the gemstone clean using your favourite polish, you can leave it near you when you are not using it but if you put it away then obviously wrap in tissue to avoid damage. Do not let other people use your gemstones as they will pick up their energy and it may take some time before it tunes back into your vibrations. 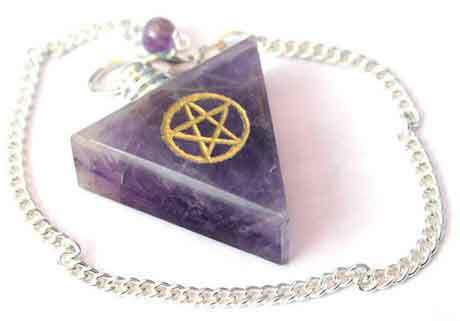 Use this pendulum for dowsing as the indigo in the amethyst will help give psychic protection, the violet will help put you in touch with your intuition. The pentagram will act as a symbol of psychic protection reinforcing the indigo and the gold colour will help you value and believe in your own wisdom and judgment. Using a Pendulum for Basic Dowsing. There are many good books, e-books and articles on the Internet that have detailed instructions and charts on how to use a pendulum for dowsing. I am not going to try and compete with that, but try to show you how to dowse effectively, to do that you need to protect yourself from any negative influence including yourself, other people and other spiritual entities that may be present. The reason being is that pendulums swing in the direction of the answer from electro-magnetic energy generated by the spiritual side of our physical body sometimes called the higher self, because quartz has special electrical properties it is particularly suited for use in pendulums. You can with either wishful thinking or denial make the pendulum give whatever answer you want it too, so can the spiritual energy of anyone else present alive or dead! The difference between a pendulum and an Ouija board is that the energy to swing a pendulum comes from within you, so you can defend yourself. Whereas with the Ouija board the energy is external and you have no control over it whatsoever and therefore, as many people have found out you can invite negative influences into your life. So do not use an Ouija board. I will repeat that as you need to know that when using a pendulum not only you but other people present can also make the pendulum give whatever answer they want, and can it be taken over by other spiritual energies present and they too can spell out whatever message they want to give you; usually the wrong answer or nonsensical gobbledygook. The skill lies in being able to spot when this is happening and being strong enough to be able to fend off any attempt at controlling what is going on and that takes time and practice. Keep your pendulum with you or under your pillow for a while so it picks up your vibrations. After a time you will be able to get a certain feel from the pendulum when you hold it, if it suddenly goes heavy or the chain feels stiff like wire then something has taken it over. If this happens stop say an affirmation, cover yourself in white light and cleanse the pendulum by putting it in a jug and put it under a fast running tap so that bubbles of water take the negativity away dry it off and try again. Be patient, it may take several years of practice while your power to fend off attack grows, during this time you may feel a change in the sensitivity of the pendulum depending upon who is guiding your higher self at the time. This leads to also knowing the limitations of a pendulum as a direct means of divination or predicting the future, basically its a waste of time; so are questions about relationships! Never trust a ready made answer, even as an experienced dowser when asking what do I do next I have always been told to use my own intuition and work it out for myself; relying on your pendulum can be addictive and can take away the ability to make decisions for yourself. Always believe in your own wisdom and judgment, as we have free will nothing is for certain unless we make it so and it will not fall out of the sky by some act of divine intervention. Having said all that indirectly, the pendulum can be very useful in helping you get in touch with your own intuition not by asking direct questions or wanting answers but simply by swinging it in a small circle, the electro-magnetic energy it generates helps you connect with your higher self, so switch off, go over the issue and sort it out in your own head. You will not get any direct answers but perhaps a gain greater insight, some clues or pieces of a jigsaw that you can then fit together. Get in touch with how you feel and when you get a gut feeling or sensations you know you are being told something; but you need to test it out before you act to know what it means. If you need a bit of extra help you can use the pendulum to dowse from a selection of Tarot cards or the runes, I use a pendulum to dowse from a whole pack of rune vision cards, however, like the Tarot you need to be able to read the cards to know what you are being told. Following these Guidelines before You Start. You should be calm and relaxed; never use your pendulum when you are angry, impatient, or in any sort of emotional upset. Never use your pendulum in the presence of anyone who is like the above or showing signs of negativity. The burning of incense such as a mixture of frankincense and myrrh will help to protect you against negativity. Candles will also help as the flame is a vibration that will help put in in touch with your intuition, lavender for the violet colour is best. Say an affirmation, you can find numerous examples on the Internet, but to simply say ‘may this be for my highest benefit’ will do. You need to do a white light visualisation of all those present being inside a white light globe to guard against negativity. Now for the practicalities, hold the pendulum in either hand allowing about 3 to 4 inches of chain for it to swing, there are three basic answers Yes, No, Maybe. Swing the pendulum in a straight line in front of you so the point covers about 4 to 5 inches, then ask show me your Yes; the pendulum will swing to the left or right to indicate the direction of a yes answer. Repeat with show me you No just to get confirmation, then ask show me your Maybe, the pendulum will swing at a 45 degree angle to a line straight in front of you. Shuffle the cards an focus on your present situation or the question you wish to ask. When you are ready stop and select nine cards at random from the deck, then lay them out in front of you in a row. Let the pendulum select which cards apply to you with a yes answer, the pendulum will also decide how many cards to turn over. The cards can mean many different things to help select the correct meaning use a good book on the Tarot and dowse the book with you pendulum so that a yes answer will indicate which text is relevant to you. Bear in mind that you will receive a specific answer but you may be given an insight into a possible outcome for which you must take the appropriate action to either bring about or avoid. The future will only happen if you make it happen! This entry was posted in Tarot, Runes and Divination and tagged affirmation, colours, gemstones, intuition, pendulum, pentagram, positivity, psychic protection, runes, tarot. Bookmark the permalink.